Blogging with your class is fun. Students have the opportunity to write for a worldwide audience, research, learn technology, and share their learning with the world. This guide gives teachers time-saving tools, checklists, assessment forms, parent communication, and student contracts. Additionally, there are 99 differentiated writing prompts. The teacher or the student can choose a "mild," "medium," or "extra spicy" variation on a topic. Use the tic tac toe board to encourage students to challenge themselves. The differentiated topics make great mini-lesson topics, and they are perfect for the student that loves to play with technology in creative ways. 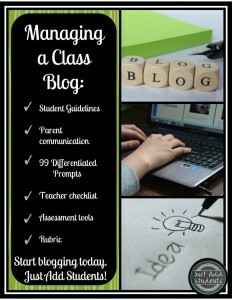 Get started blogging with your class!